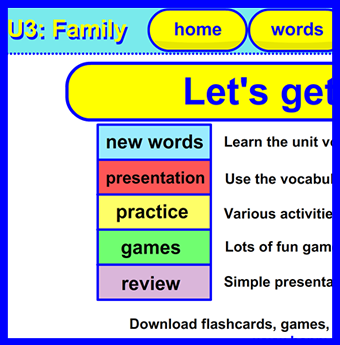 Download Happy Everyday English IWB Lessons, Flashcards, and more! New free lessons uploaded every month! Don’t forget to follow me on twitter @GriffyHEE or on Youtube to stay up-to-date on everything coming from HEE. Lessons have been designed to be used with interactive white boards (IWBs). You can still use these lessons with a projector and non-interactive boards, but some games won’t be properly playable. A specific example of this would be the race to touch game. The starter curriculum is intended for low-level ESL students and use with interactive boards. These units are packed full with games and activities. Your students will love these! Each unit contains enough content for multiple lessons. Each unit has a specific theme, such as animals, family, color, etc. More than 20 games and activities per unit. The teacher has full control of the lesson! Choose what activities and games you want to do. Choose whether or not to practice using pictures or words. You can even change mid-game! Lightweight files. Less than 10 MB per unit! No installation necessary! New content uploaded every month!